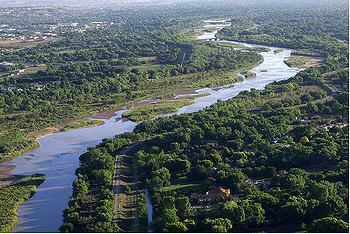 ALBUQUERQUE, New Mexico, September 29, 2011 (ENS) – Acquisition of 570 acres to establish a national wildlife refuge along the Rio Grande in Albuquerque has been approved, Secretary of the Interior Ken Salazar announced today in Albuquerque. “With the support of Bernalillo County, the Trust for Public Land, New Mexico’s Congressional delegation, and many partners, New Mexico will gain its first urban national wildlife refuge,” Salazar said. Only a few of the nation’s more than 550 National Wildlife Refuges are in urban areas. Located just five miles from downtown, this former dairy farm is one of the largest undeveloped agricultural properties in the metropolitan Albuquerque area. “Once complete, this refuge, which is within a half hour drive of nearly half of New Mexico’s population, will be a place for people to connect with and learn about the natural world and will provide valuable habitat for wildlife, including the endangered southwestern willow flycatcher,” said Salazar. The U.S. Fish and Wildlife Service and Bernalillo County have long explored the possibility of establishing an urban refuge on the former Price’s Dairy Farm. In March, the Albuquerque City Council passed a resolution endorsing the proposal and earlier this year, New Mexico Senate Memorial 43 in support of the refuge proposal was introduced by State Senator Tim Eichenberg and passed unanimously. After completing studies and planning documents, the Service is now authorized to acquire land and establish the refuge. The Fish and Wildlife Service acquires lands for refuges only from willing sellers. Condemnation is not used. The current owners of the 570-acre site are interested in selling the land. Total cost to acquire the land and establish the refuge is estimated at $20 million. The Bernalillo County Commission has set aside $5 million to help with land acquisition. Additional funding for purchase of the land may come from the Land and Water Conservation Fund, established by Congress in 1964 to use revenues from offshore oil and gas drilling to support conservation. Joined by U.S. Senator Jeff Bingaman, Congressman Martin Heinrich, both Democrats, and Bernalillo County Commissioner Art De La Cruz, Salazar said a refuge in this location would fulfill the goals of President Barack Obama’s America’s Great Outdoors initiative to work with community partners to establish a 21st century conservation ethic and reconnect people, especially young people, to the natural world. An urban refuge also will help generate economic growth and support jobs by attracting visitors, Salazar said. Recreation in refuges, national parks and other public lands led to nearly $55 billion in economic contribution and 440,000 jobs in 2009, Salazar said. National wildlife refuges currently support an estimated 35,234 jobs. “At 570 acres, this former dairy is one of the largest remaining farms in the Middle Rio Grande Valley and is the largest agricultural property within the Albuquerque metro region. There are very few opportunities like this one that allow us protect open space in highly urban areas,” said Senator Bingaman, who chairs the Senate Energy and Natural Resources Committee. “I’d like to thank Secretary Salazar for coming to New Mexico today to make this exciting announcement, and I’d like to thank the many individuals and local officials whose involvement made this urban wildlife refuge a reality,” said Bingaman. “Years from now people will say how glad they are that we had enough foresight, determination and love that we preserved this place forever, and for them,” said Bernalillo County Commissioner De La Cruz. The Trust for Public Land has been working for years to protect the Price’s Dairy property. “Our goal is to protect land for people and there is no better example of that then making sure that this special place is protected for future generations,” said Trust for Public Land President Will Rogers. The total cost of the project is estimated to be at least $20 million, which includes substantial senior water rights. TPL is working with other federal and non-federal agencies on securing additional funds. The Fish and Wildlife Service intends to work with its partners to establish environmental education programs at the refuge and provide demonstration areas for sustainable agriculture. Once fully restored, visitors to the Refuge will likely be able to see waterfowl, small mammals, and neotropical migrant birds, including the endangered flycatcher. 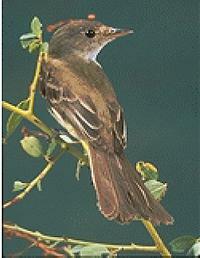 The southwestern willow flycatcher is a small, neotropical migrant bird that breeds in streamside forests of southern California, southern Nevada, southern Utah, Arizona, New Mexico, western Texas and extreme northwestern Mexico. Within this range, the flycatcher has lost more than 90 percent of its habitat to dams, water withdrawal, livestock grazing, urban sprawl and other factors.